NEW YORK, NY.- On 12 May 2010 Sotheby’s Contemporary Art sale will offer works by some of the most important artists of the 20th and 21st centuries, including Mark Rothko, Andy Warhol, Jackson Pollock, Roy Lichtenstein and Brice Marden, among many others. The sale presents an interesting survey of the key artistic schools of the period including Abstract Expressionism, Pop Art, Minimalism and more recent contemporary art. The auction presents collectors with an opportunity to acquire works that, in many cases, have not been offered for decades. The overall estimate for the sale is $114/162 million. sensual masterpieces. Rothko embraced a profound faith in the realm of aesthetics and continuously sought his own personal vision in that realm. Over the course of his oeuvre, he developed subtle reworkings of breathtaking, oscillating color forms that are accessible and thought provoking all at once. Rothko's masterful technique allowed him to create dazzling velvety tones on the surface of his canvases that achieve harmonious equilibrium between absence and presence. Rothko also deeply admired the French painter Pierre Bonnard, and no doubt would have attended the artist's 1948 memorial show at the Museum of Modern Art in New York. Bonnard's paintings have a rich painterly affect that is in sympathy with the optical importance of Rothko's own brushstrokes that illuminate his canvases. Rothko draws on both Bonnard's rich palette and his treatment of light. Rothko's fascination with light can also be traced to the Luminists a tradition in American painting that dominated the third quarter of the 19th century. Luminism is centered on the authority of light artists belonging to the movement, such as John Kensett, confront the viewer with an empty vista that is more about colored light than terrestrial soil. Light in these paintings, and in Rothko's works, is the primal source of energy. Rothko resurrects the Luminists in an abstract tradition. The blinding gold sunlight in Kensett's 1872 Sunset on the Sea is a potent metaphor for the unseen world or spirit. The present work has a similar altar-like frontality and elicits transcendental emotions. In 1958, Rothko commented, "Some artists want to tell all like at a confessional. I as a craftsman prefer to tell little ...There is more power in telling little than in telling all. Two things that painting is involved with: the uniqueness and clarity of image and how much does one have to tell." (Mark Rothko's "Address to Pratt Institute, November 1958" in Miguel López-Remiro, ed., Mark Rothko Writings on Art, 2006, p. 127) Both the Kensett and Rothko paintings bring forth a meditative reaction in the viewer, and are a successful marriage of simplicity and complexity that both draw the viewer in and push us away. particular movement. Newman and Rothko shared a concern for color, space, volume and light, yet Newman chose to interpret his color fields with vertical stripes ("Zips") that activated the surface and Rothko opted for the stacked bands of color and rectangles. restricted and the composition, while still monumental in size, became increasingly measured. Untitled has a refined sense of balance and an astounding blend of colors. 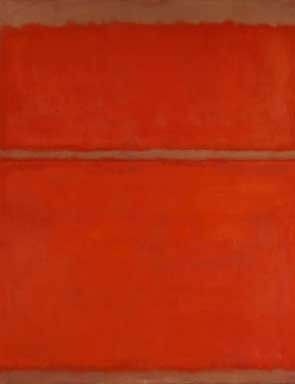 Confronting the painting is an intimate and emotional experience, heavy with a sense of human passion, just as Rothko intended. As Rothko wrote, "I paint very large pictures. I realize that historically the function of painting large pictures is painting something very grandiose and pompous. The reason I paint them, however I think it applies to other painters I know is precisely because I want to be very intimate and human. To paint a small picture is to place yourself outside your experience, to look upon an experience as a stereopticon view or with a reducing glass...However you paint the larger picture, you are in it. It isn't something you command." (Mark Rothko, "A Symposium on How to Combine Architecture, Painting and Sculpture", Interiors, vol. cx, no. 10, May 1951, p. 104) Bathed in a painterly mist, the present work projects its fiery hues out of the pictorial space, inviting the viewer to contemplate the space Rothko has created and leading us to extreme states of feeling. Jackson Pollock is one of the most influential masters of the 20th century, and his rare and exuberant Number 12A, 1948: Yellow, Gray, Black dates from the time of his most creative and transformative period (est. $4/6 million). From 1948 until her death in 1982, this painting was in the collection of his second New York dealer, Betty Parsons, and was extensively exhibited beginning at Parsons’ own gallery in 1949. Number 12A, 1948 was also one of three works illustrated in the infamous August 8, 1949 Life magazine article titled “Jackson Pollock – Is he the greatest living painter in the United States?” that proclaimed Pollock’s early and eternal role as a leading figure in American art. Jackson Pollock, Number 12A, 1948: Yellow, Gray, Black. Signed and dated 48. Enamel on gesso ground on paper, 22¾ x 30¾ in. (58 x 78 cm) Est. $4/6 million. Photo: Sotheby's. 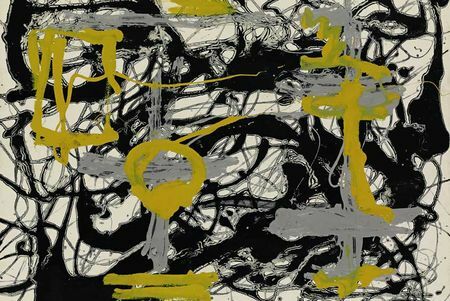 NOTE: Jackson Pollock was one of the most influential masters of the 20th century, and his rare and exuberant Number 12A, 1948: Yellow, Gray, Black dates from his most creative and transformative period. From the late 1940s until her death in 1982, this painting was in the collection of his second New York dealer, Betty Parsons, and has been extensively exhibited beginning at Parsons' gallery in 1949. Number 12A, 1948 was also one of three works illustrated in the infamous August 8, 1949 Life magazine article titled "Jackson Pollock Is he the greatest living painter in the United States?" that inaugurated Pollock's early and eternal role as a leading figure in American art. The painting exemplifies the innovation that most defines Pollock's achievement as embodied in the phrase "drawing into painting", coined by William Rubin in 1967 to describe Pollock's liberation of line from figuration into abstraction. As an iconic figure, Pollock's protean myth almost obscures the fact of his monumental achievement in creating an independent aesthetic that revolutionized art during and after his lifetime. However, fellow artists have no difficulty looking beyond the legend of Pollock's artistic struggle and public antics to appreciate the art itself. With works such as Number 12A, 1948, the mixture of daring and assurance exhibited by the dynamic interplay of the rivulets of paint remain a marvel of controlled liberation. The distinctions between artistic practices did not exist for Pollock whose groundbreaking technique married paint to the freedom of drafsmanship in order to express his innermost artistic impulse. Whether Pollock's surface was a monumental canvas or paper, his pursuit was immediacy and the fluid union of material and creativity as one. Most significantly, Pollock also put gesso to brilliant use in the series of 1948 paintings on "Imperial" size paper which include Number 12A, 1948 as well as works in the collections of the Museum of Fine Arts, Houston, Yale University Art Gallery, the Metropolitan Museum in New York, the Frederick R. Weisman Foundation, Los Angeles, Tate Gallery in London and the Virginia Museum of Fine Arts, Richmond. Long a priming agent of historical tradition on canvas and wood, the use of gesso gives Number 12A, 1948 a white, slightly chalky surface. Pollock's next step was to drip shiny viscous black enamel which bound well to the still-moist gesso, producing a liberating, yet controlled co-mingling of the two mediums in a vibrating, softly blurred edge to the solid black. This delicate touch contrasts wonderfully with the muscular pools and swooping drips of yellow and shiny aluminum gray that followed, demonstrating his genius for scintillating color, rhythmic energy and painterly improvisation. Betty Parsons opened her gallery on East 57th Street in September 1946 with the support of friends who included artists such as Barnett Newman, and her timing was extremely fortuitous. In 1947, Peggy Guggenheim, the doyenne of the Art of this Century gallery where Pollock had debuted in 1943, had decided to close. Many of her artists, most notably Jackson Pollock, made the move to Parson's gallery, including William Baziotes, Hans Hofmann, Robert Motherwell, Barnett Newman and Clyfford Still. Pollock received a monthly stipend from Guggenheim and Parsons continued the arrangement, sometimes taking works of art in payment for debts to the gallery. Parsons became one of the premiere gallerists on the front lines of the avant garde movement in New York, and "her gallery was a flagship of Modernism just at the moment when American art declared its primacy. She figures prominently in the establishment of countless artists who now are regarded as geniuses and iconic figures in the canons of abstraction.'' Parsons was an artist as well and reveled in art's potential to illuminate humanity's future by opening the public's mind and sensibilities. She recognized Pollock as her greatest champion in this vanguard. "Pollock's new paintings, swept with movement, were solid networks of thick enamel. Betty rejoiced in the strong pattern and abiding sense of design and structure that suffused Jackson's paintings. `Idiots!' she would shout at or about anyone failing to see Pollock's merits as a painter. `Why can't they see the great, great order here? Why can't they know art when they see it in its purest state.' She believed that Jackson Pollock, in his daring and in his inevitable paean to order, had achieved a higher greatness, to her way of thinking..." (Lee Hall, Betty Parsons: Artist, Dealer, Collector, New York, 1991, pp. 90-95). While contemplating Number 12A, 1948 in her collection, Parsons could observe Pollock's manifest contribution to the limitless possibilities of abstract art that she most admired. Willem de Kooning, Sagamore, 1955. Signed. Oil, enamel and charcoal on paper mounted on board, 22 1/2 x 28 in. 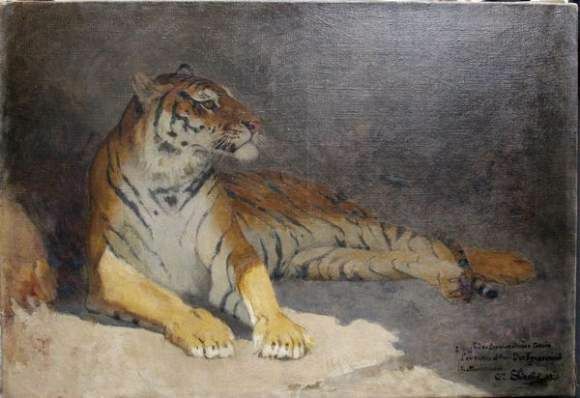 57.2 x 71.1 cm. Executed in 1955. Est. $3,5/4,5 million. Photo: Sotheby's. about, received the most accolades, enjoyed the most exhibitions, and has the largest and most varied body of work. As both artist and personality, he bridged the gap between the ordered dream state of Arshile Gorky and the passionate and instinctual abandon of Jackson Pollock, the other pillar of the post-war New York school of painting. Sagamore is painted with a deliberate and controlling logic of constant revision with each connective brushstroke enlivened by vibrant colors. The decisive breaks in the picture plane add a sense of frenetic movement and graphic contrapposto to the composition. Kooning's profound attention to light that would consume his later paintings of the decade and beyond, following the move to the new landscape of Long Island. The frenzied proliferation of stroke, form and plane of the urban landscapes has now here been slightly reduced, lending Sagamore a relatively intimate restraint and clarity. The broad simplification makes prominent the manner of de Kooning's paint application and the resultant textural complexities of the medium of oil paint. The simplification and limitation of the number of the artist's gestures, which served to expand the picture plane, as well as an adoption of a specifically lighter palette that tended towards yellows and pinks better suited to the smaller scale, created compressed yet joyful compositions such as Sagamore. Henry Geldzahler wrote of de Kooning's painting at this time, they are "...packed with shapes, allusions, actions and counteraction, they pile ambiguity on ambiguity; sometimes, it would seem, they are painted at lightning speed, at others in a more relaxed contour loving gesture." (Exh. Cat., New York, Willem de Kooning: Abstract Landscapes, 1955 1963, 1987, n.p.) The present work is a brilliant example of both of these approaches. 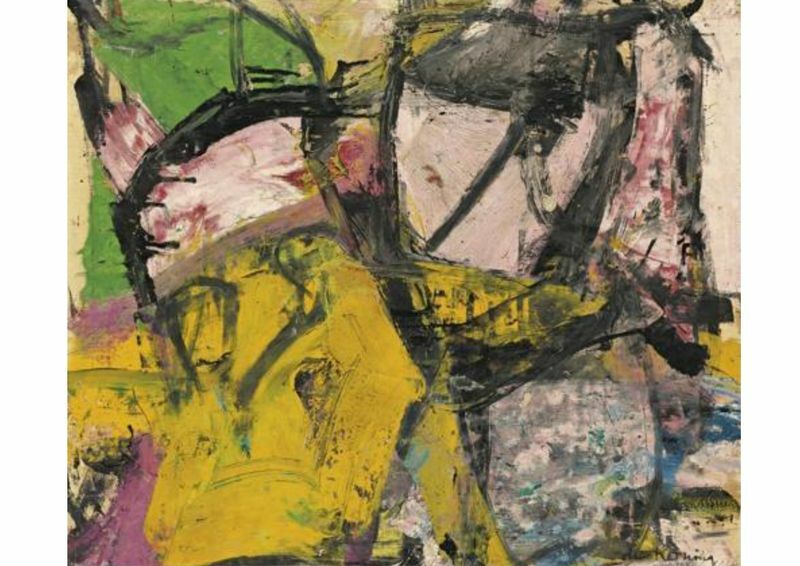 De Kooning truly acted as a decisive leader in the formative years of the New York art scene. In April of 1956, his solo show at Sidney Janis, which included Sagamore, was an instant success that determinedly solidified the artist's renown. At this time both American and European collectors alike became seriously interested in de Kooning's abstractions and he quickly became a popular and commercially successful artist. The sweeping gestures in the present work represent the artist at his most liberated. Not even the landscape stands in the way of his act of painting. De Kooning's oeuvre reflects a sensibility that embraces both classic and romantic tendencies and an overall deep respect for paint handling and abstract forms so clearly apparent in this exemplary work from the height of the artist's career. 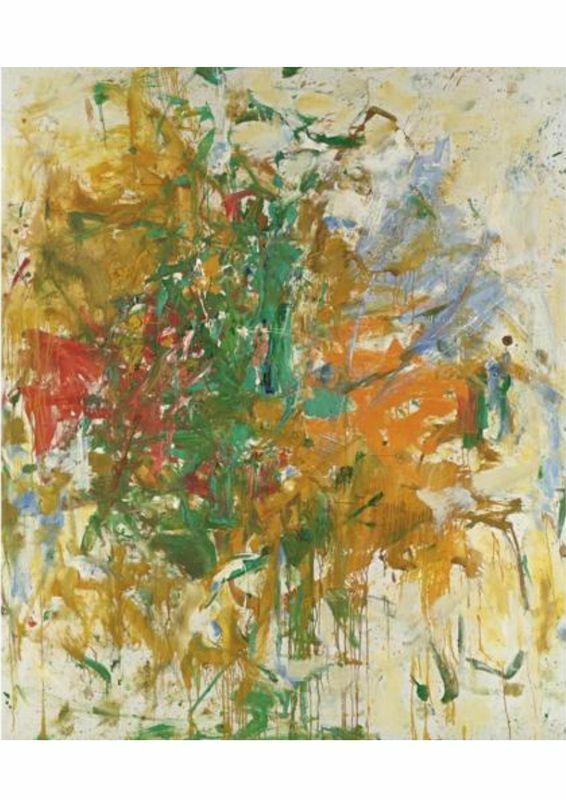 A further highlight of the Abstract Expressionist woks in the sale is Vera Cruz by Joan Mitchell (est. $3.5/4.5 million). The work was painted whilst Mitchell was living and working in Vétheuil, the tiny village known for Giverny, Monet’s famous estate and garden. Like many Monet works, Vera Cruz changes dramatically as the viewer walks towards it, with ever increasingly nuanced hues. The canvas encompasses all of the painterly techniques for which Mitchell is famous – quick brushstrokes, languid drips, calligraphic lines, dense impasto and the thin base coat. The vivid colors - lush green, dusky reds and copper earthiness - create a harmony akin to the very process of nature itself. Although her approach is anything but ordinary, Mitchell considered herself a traditional painter. Her works are rooted in the landscape and captures the emotions and memories that could be inspired by nature. Joan Mitchell, Vera Cruz, Signed; signed and titled on the stretcher. Oil on canvas, 93 1/2 x 78 5/8 in. 237.5 x 199.8 cm. Painted circa 1960 - 1962. Est. $3,5/4,5 million. Photo: Sotheby's. NOTE: In 1955, after eight years in New York City, Joan Mitchell moved away from the capital of the art world, home to her fellow, mostly male, Abstract Expressionists Hans Hofmann, Arshile Gorky and Jackson Pollock. She took up residence first in Paris and then in Vétheuil, the tiny village known for Giverny, Monet's famous estate and garden. Like Monet, whose impressionistic interpretations of local landscape change drastically according to the viewer's distance from them, so too does Joan Mitchell's visceral use of color. With each nearing step, hues get increasingly nuanced, an element of the work certainly related to Mitchell's own practice of removal: "I spend a lot of time looking at the work. I paint from a distance. I decide what I'm going to do from a distance" (Exh. Cat., New York, Whitney Museum of American Art, Joan Mitchell, March May 1974, p. 8). In Vera Cruz, executed in 1960-1962, dusky reds give way to crimsons marbleized with ivory, while crude browns cede a copper earthiness that almost glints in the light. It seems that all of the painterly techniques for which Mitchell is famous the quick brushstrokes, the languid drips, the calligraphic lines, the dense impasto, the thin base coat are synthesized in Vera Cruz which means "true cross'' in Spanish. Pale periwinkles and delicate whites lay the groundwork for the thick, palette knife-applied deep greens and orange in the most concentrated passages. Mitchell's paintings of the 1950s and 1960s move toward tightly centered compositions from looser knots of paint, and Vera Cruz combines traits of both. The lush green that plays a primary role in so many of her works throughout the coming decade is both loose and frenetic, bringing a lyrical cohesion to the hint of a sprawling center. Mitchell, never too concerned with particularly balanced compositions, seeks harmony through color rather than from form alone. Organic, burgeoning, and vital, Mitchell's work mimics the very process of nature itself. Abstract paintings, that, if anything, resemble lush bursting flowers at their most figurative, compel, rightly or wrongly, a certain degree of psychological projection. There is something undeniably carnal about Mitchell's energetically applied paint. And anything that announces `Life' with such force also at least whispers of `Death'. Self-possession is a precondition for what Linda Nochlin referred to as Mitchell's "rage to paint." To create something simultaneously so violent and so organic, especially on such a large scale, requires, without question, a great commitment on the part of the artist. Mitchell struggled throughout her life with moody tendencies and a profound sense of isolation; but painting, she explained, "is the opposite of death, it permits one to survive, it also permits one to live." (Jane Livingston in Exh. Cat., New York, Whitney Museum of American Art [and travelling], The Paintings of Joan Mitchell, 2002, p. 64). Even the most cursory of glances makes obvious the urgency of Mitchell's practice. The isolated units of her abstractions are emotive, and it is difficult not to lend them human qualities: smears indicate regret, while streaks suggest unbridled joy; drips appear melancholy, splatters angry. It is as if the paintings are literal maps of Mitchell's heart and mind; the harnessed properties of spatial relations, color, and brushwork form a sort of mental landscape. The brush, with the sensitivity of a seismograph's needle, can detect the slightest fluctuations in mood. The early sixties proved a prolific yet emotionally draining period for Mitchell. Personal heartbreaks and crosshemisphere relocations seem to have propelled a stylistic break from her compositions of the fifties, in which form and color were more uniformly distributed across the canvas. The newer paintings show a growing preference for centralized masses of unrestrained color. These works are transcendent but not chaotic like the subsequently titled "Black Paintings" created between 1963 and 1967. Rather, these schematic landscapes reveal beautiful solutions to the potential meaning of abstraction and to the visual possibilities within a strictly gestural process. Certainly recognized in her lifetime by American institutions and critics, Mitchell's work is increasingly lauded posthumously for its ability to remain original in an age of paradigm shifts. Though ingratiated into the New York City art world before moving to France, Mitchell's deliberateness and control established her as cut from a different, though related, cloth from her fellow Abstract Expressionists. In 1951, Mitchell was included in the fabled Ninth Street Show organized by Leo Castelli. She held her first solo exhibition at the New Gallery in 1952, and just one year later, the revered Stable Gallery took her on a considerable accomplishment for any artist, but particularly for a young woman. Supported and encouraged by the reigning dealers and artists of her time, Joan Mitchell's formidable skill was unleashed upon the art world with whirlwind force. Though her approach is anything but ordinary, Mitchell considered herself a traditional painter, and it was perhaps this move away from metropolitan New York and to the bucolic country side of France that allowed Mitchell to reacquaint herself with the influences she held most dear. Though surely of a piece with her contemporaries in New York, Mitchell's reverence for nature and her interest in impressionistic self-expression, especially in the context of her new French home, aligns her with Monet and van Gogh, early masters of the methods she too would champion. The large majority of Mitchell's works are tethered to familiar landscapes, memorized forms, and visual recollections. Memory hauntingly persists in Mitchell's work, and a lacuna is made obvious between the time in which an emotion was felt and the time in which Mitchell recorded it on canvas. The frenzied layering of paint and the violent juxtaposing of color suggest that sensations can not only remain present in vestigial ways or survive fully in tact, but perhaps even be magnified by the prism of time. Mitchell's lush canvases, which sought not to represent nature but to capture the emotions and memories that could be inspired by nature, radiate life and rowth. These meditations on place and the moments they once held are expression of a deep engagement with life. Among the highlights of Pop Art in the sale is an iconic and rare Self Portrait by Andy Warhol, executed in 1986 just prior to his unexpected death the following year (est. $10/15 million). The painting is from Warhol’s final series of Self Portraits - widely acknowledged as the most important of his career. The monumental canvas, measuring 108 x 108 in., is one of only a handful executed by the artist and one of only two that are known to be privately held. This superb Self Portrait is an important example of a major theme in the artist’s oeuvre: the complicated dichotomy between the public and private persona. Andy Warhol, Self Portrait, Acrylic and silkscreen ink on canvas, 108 x 108 in. 274.3 x 274.3 cm. Est. $10/15 million. Photo: Sotheby's. private identity was a central motif in his art as in his life. Warhol's radically innovative approach to subject matter and to artistic technique was ideal for investigation of the self-portrait and he would revisit the genre throughout his oeuvre. Warhol's celebrity centered on the self-invented and intriguing public persona that he created during interviews and public events. Among his images of the famous that established Pop art in the 1960s, he also became an icon in his own visual repertoire. Belonging to his 1986 self-portraits, the last before his untimely death, this painting encapsulates Warhol's attitude toward presenting his outer self, tempting us with the thought that he might finally let us glimpse his most intimate inner self. By portraying himself through different decades of his life, Warhol became the most important subject matter of his many portraits. More than any artist before him, Warhol's image, identity and cultural persona were inextricably bound to his art. Witnessing the conjunction of Warhol's celebrity subject matter and his personal fame, the self-portraits result in an ironic layering of subject and author. Warhol made the first mature selfportrait of his career in 1963, in which his appearance is masked by dark glasses and the graininess of the then new screen process, followed by a subsequent small series in 1964, similarly based on a photo-booth photograph. These photo-booth portraits began with the commissioned portrait of the collector Ethel Scull. A sitting in a photobooth resulted in a strip of four images that exist as a montage over a short time span. At first Warhol used all four images and then in the 1964 Self-Portrait series he removed just one image from the strip yet produced the paintings in a broader range of background colors. As with the Marilyn and Liz paintings, Warhol's use of local color can be evocative and individual as the style of hair, the degree of sophistication and the mood of the face can alter based on the application of color from canvas to canvas. By 1966, the year of his third great series of self-images, he was a star in his own right whose constructed public persona was almost as famous as his artistic production. Propelled into the public limelight, Warhol captured on canvas his role as the most alluring and elusive star in this most fertile site of artistic self-discovery. The introspective hand to mouth pose fading into the shadows is at once revealing and mysterious. Warhol is showing only a particular side of himself while still concealing something from the viewer. It was not until 20 years later, in the series to which the present work belongs, that Warhol would find an equivalently powerful self image. In the 1960s, Warhol was an aloof commentator on the consumer culture that was sweeping a prosperous America. By 1986, he and his art were synonymous with contemporary American culture. Over time, the works had become increasingly complicated. Although the present monumental purple and black canvas is by far the largest format for any Warhol self-portrait and could be viewed as the most disconnected from reality because of size alone, it is also the most raw and intimate look into the artist in the last months of his life. 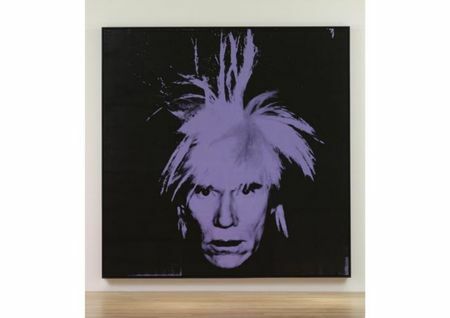 Possibly it is a clarity that comes with approaching death that allowed Warhol to forgo his vanity and be confident enough to reveal his entire face. Warhol was always intrigued by the human face. Here, for the first time, the artist's own features take center stage in an impactful masterpiece that leaves the artist exposed. Resembling the canonical self-portraits from Dürer to Cézanne to Bacon, this is an intimate exploration of the self, unedited and brutally honest. The present work is both a continuation of and assault on that tradition. The process of the photographic silkscreen satisfied a need for resemblance and allowed Warhol to manipulate contrasts and highlight certain areas while blowing out others. In the 1971 interview with Gretchen Berg "Nothing to Lose", Warhol states, "If you want to know all about Andy Warhol, just look at the surface: of my paintings and films and me, and there I am. There's nothing behind it." This was a prophetic statement of where his self-portrait painting would ultimately end. In the present work, Warhol gives us 11,644 square inches of painting surface, and about half of that is his visage. He is there for us to confront and yet disappears into inky black ominous darkness - a disembodied head poised for analysis. It is believed that only five of the 108 in. square format self-portraits depicting this exact image exist. Three are known to be in museums: yellow and blue versions are in the Andy Warhol Museum in Pittsburgh and a green version at the Fort Worth Art Museum. There is a red version in a private collection and the present purple version completes the quintet. The rich purple gives this work a regal presence and recalls Warhol's Lavender Disaster from 1963, also measuring 108 in. high, connecting an image of the Death and Disaster series with the present work. This landmark painting is truly a culmination of everything Warhol stood for at the time and will be remembered for in art history a potent combination of innovation, celebrity, vulnerability and death. AUTHENTICATION: Executed in 1986, this work is stamped twice and numbered PO.083 by the Estate of Andy Warhol and the Andy Warhol Foundation for the Visual Arts and also initialed twice by Vincent Fremont and on the overlap. A further Warhol work in the sale is Flowers from 1964 from the series which was the subject of the artist’s first Leo Castelli Gallery exhibition in November that year (est. $5/7 million). It quickly became synonymous with the Pop Art movement which was rapidly gaining popularity and momentum. The flowers in the picture are based on a photograph of seven hibiscus blossoms from a 1964 photography magazine. The outline of the plants was stenciled onto a printed canvas before the green acrylic of the surrounding grass was added and finally the screenprint image applied over the dried impressions of plants. Flowers follows the ‘Death and Disaster’ series and whilst the bright subject matter may seem distant from the images of electric chairs, suicides and car crashes a flower can also be seen as a metaphor for the frailty of life - whilst exuberant now, they are soon to perish. Andy Warhol, Flowers. Each signed and dated 64 on the overlap, acrylic and silkscreen ink on canvas in four panels, Overall: 48 x 48 in. 122 x 122 cm. Est. $5/7 million. Photo: Sotheby's. NOTE: An everlasting image of twentieth-century art, Flowers, executed in 1964 is part of the series that was the chosen subject for Andy Warhol's first show at the Leo Castelli Gallery in New York City. Having left the Stable Gallery, Warhol spent the summer of 1964 preparing for his inaugural show at Castelli, which was scheduled for November. Warhol regularly worked in series, preferring to dedicate his gallery exhibitions to a single theme or subject, as epitomized by the seminal exhibition of 32 Cambell's Soup Cans at the Ferus Gallery in 1962. 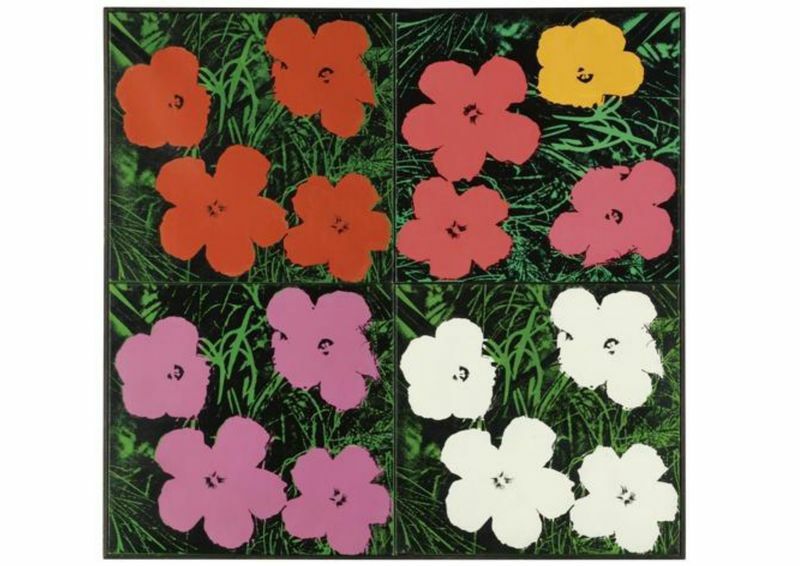 Warhol's move to Leo Castelli provided the catalyst for a new set of works whose success was so instantaneous that it sold out immediately, and the Flowers quickly became synonymous with the Pop art movement which was rapidly gaining in international credence. Comprised of four 24-inch Flower paintings, the present work is a grid-within-a-grid, including both Warhol's single-color canvases here white, pink and red -conjoined with a multi-colored Flower in a microcosm of the multi-panelled installation at the Castelli Gallery in November. Ten days prior to the Castelli exhibition, Warhol delivered 45 Flower paintings in the 24-inch format to the gallery from which 28 were hung in the show in four rows of seven. Three panels of the present work were among this first delivery (LC 72 121), while the fourth (the all-white flowers, LC #153) was part of later consignments to Castelli. The previous owner of the present painting was Dayton's Gallery 12 in Minneapolis whose director, Felice Wender, was a close friend and early supporter of Warhol. She lent two of the panels in this painting to the 1970-1971 Pasadena retrospective exhibition of Warhol's work which included a multi-panel installation of 24-inch Flower paintings similar to the Castelli show. Felice Wender is likely to be the one who combined the four panels into one work when, shortly after the retrospective, Dayton's Gallery 12 consigned Flowers to Parke Bernet Galleries in November 1971. The multi-panel installation at Leo Castelli exploited these factors to its full pictorial potential, arranging the canvases like tesserae on the walls to elicit subtle variances and rhythmic patterns across the matrix of square canvases. The curvilinear forms of the quasi-abstract petals dematerialized the rectilinear grid-like structure created by the gaps between the canvases. The orientation of the flower composition was not consistent throughout the four rows of 28 panels exhibited at Castelli or later at the Pasadena Art Museum, giving an early sign that Warhol felt the orientation could be variable as in the present Flowers. Between June and September of 1964, Warhol's studio the Factory was a production line for Flower paintings of different sizes. Throughout this phase of his artistic development, Warhol pioneered and refined the screenprinting process that he had made his own. The first artist to make extensive use of the still revolutionary process, Warhol was attracted to the connotations of mass production and the effacing of the hand of the artist. The production underwent three phases: firstly, the forms of the flowers were stencilled and the colored paints were applied by hand onto the primed canvas; once dry, the flowers were masked and the green acrylic of the surrounding ground was applied with a wide brush; finally, the screenprint image was applied over the dried image. Over the course of painting this series of images, Warhol's choice of paints would also include the more fluorescent Day-glo colors seen in the multi-colored panel in Flowers. The idea to make flowers the subject of a major series was apparently suggested to Warhol by Henry Geldzahler, then curator of the Metropolitan Museum of Art in New York. By choosing to depict the motif of flowers, Warhol was wilfully engaging with an established canon of still-life painting stretching back centuries: "In a funny way, he was kind of repeating the history of art. It was like, now we're doing my Flower period! Like Monet's water lilies, Van Gogh's flowers, the genre." 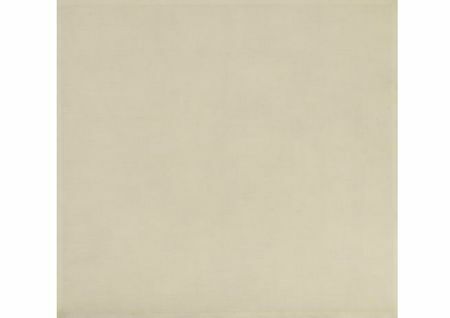 (Gerard Malanga as cited in A Year in the Life of Andy Warhol, New York, 2003, p. 74).Warhol's interpretation of this motif, however, is consciously banal and synthetic: in the first instance he rejects the intricate compositions of the Dutch still-life tradition in favour of an overhead perspective which banishes the horizon and flattens the shape of each petal; secondly, the complex color harmonies of, say, Monet's water lilies are dispensed with in favour of planar zones of flat color. Indeed, throughout the series, Warhol chose synthetic, unnatural colors whose artificial hues belied their manufactured plasticity. As was his usual practice, when Warhol converted the original color photograph into a two tone screen, he radically heightened the contrast of the original image. In effect, the minute details are lost and the forms become increasingly abstract. As a result, the Flower paintings are the most abstract works that Warhol produced in the 1960s. After the Death and Disaster series of 1962-1963 which depicted sensational images of electric chairs, suicides and horrendous car crashes, the motif of four blossoming hibiscus flowers appears almost as a palliative to the violence of the previous imagery. Despite its apparent decorative quality, however, which doubtless appealed to Warhol in his program to make a truly popular art form, the motif is laced with the tragedy and morbidity that permeates Warhol's oeuvre. Forever striving to capture the intangible transience of fame, the motif of the flourishing hibiscus serves as a metaphor for the brevity of celebrity. Exuberant now, but soon to perish, the flower can also be seen on a more generic level as a metaphor for the frailty of life, a haunting contemplation of death that is never far removed from Warhol's work. Lichtenstein’s Expressionist Head comes from a period when he was moving away from comic and advertising inspired paintings and starting to look at the great artists and movements of the 20th century (est. $3.5/5.5 million). The painting combines the Pop aesthetic with the techniques of the past, by drawing on both a subject – portraiture, and style - German Expressionism, of the past to create an extraordinarily powerful composition. Other influences abound too – the head is shown in both profile and full-face echoing Cubism whilst the strong lines are typical of wood-block carving. However, the influence of these older movements was limited to their aesthetic qualities rather than any deeper investigation of their underlying beliefs. Expressionist Head is a great statement of Lichtenstein’s ability to translate motifs of modern art into his own style. Roy Lichtenstein, Expressionist Head. Signed and dated 80 on the reverse. Oil and magna on canvas, 72 x 60 in. 182 x 152 cm. Est. $3.5/5.5 million. Photo: Sotheby's. NOTE: Expressionist Head from 1980 emerges at the end of an important period of creativity for Roy Lichtenstein. 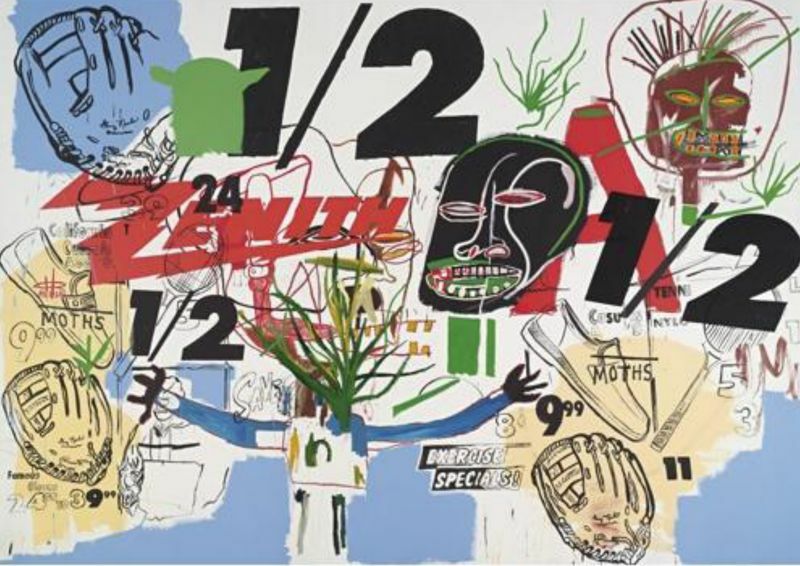 In the 1970s, the artist shifted his attention away from the comic and advertising inspired paintings of the 1960s which had established him as a star in the Pop art movement. Lichtenstein now turned to the nature of painting itself by contemplating the great artists and movements of the 20th century. The works executed between 1974 and 1980 engage with the dynamics and mechanics of Futurism, Surrealism, and German Expressionism. With bold line and vivid color, Lichtenstein created a unique style that combined the Pop aesthetic with techniques of the past resulting in works that herald his ultimate subject: art about art. Many avantgarde and Modernist movements earlier in the century had derided traditional genres such as nudes, landscapes, and narrative painting. Yet as the century progressed, most artists acknowledged that the subject matter of figurative and landscape art never completely disappears from aesthetic considerations, and the dialect between the subject of art and the techniques of art was nowhere more thoroughly explored than in Lichtenstein's oeuvre. In Expressionist Head, the inspiration from both a former genre (portraits) and style (German Expressionism) has led Lichtenstein to an even more boldly graphic technique and an extraordinarily powerful composition. The most inventive and intellectual artists know that the investigation of the past can lead to the most enlightened and liberating innovations of the present: "[Lichtenstein's] claim about the images of art history was that many of them stand out so strongly that they have imprinted themselves in our minds as a kind of artistic logo, just as particular genres and subjects have: still lifes, landscapes, pictures from the artist's studio, and so on" (Exh. Cat., Humelbaek, Louisiana Museum of Modern Art, Roy Lichtenstein: All About Art, 2003. p. 6). Though perhaps most famous for his Ben-Day dot comic paintings from the 1960s, Lichtenstein cemented his place in the trajectory of the art historical canon with these referential works from the 1970s to 1980: "he confirms with his paraphrases of the works of other artists that history lies like a kind of cultural DNA in us. ...Lichtenstein's images from the history of art are images of the history of art" (ibid. p 15). By the 1970s, Lichtenstein's art sources were far-ranging. In this case, Conrad Felixmüller attended the Dresden School of Applied Arts and the Dresden Art Academy from 1911 to 1915. Between 1915 and 1926, he worked as a freelance artist, his drawings and prints appearing in avant-garde magazines such as Der Stürm and Die Aktion. As an Expressionist artist, he was reviled by the Nazis who included his works in the 1933 and 1937 German exhibits of 'degenerate' art. Felixmüller's Depressed in the Studio places the self-portrait head close to the picture plane, dominating the composition. The unfurling facets of the head, shown simultaneously in profile and fullface, echo the style of Cubism, presenting multiple view-points at once through a collage-like assemblage of planar elements. The strong lines, typical of the wood-block carvings, energize the cerebral and hermetic Cubist presentation with a visceral power typical of German Expressionism, which "gave twentieth-century art a new artistic language, imparting an intense psychological expression to painting through the use of distorted forms, jagged lines, and violent colors" (Ibid. p. 251). Visually, both the Expressionist movement and the woodblock technique would pair perfectly with Lichtenstein's reductive aesthetic and compositional awareness. 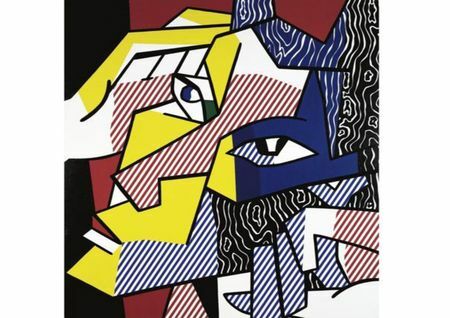 In Expressionist Head, Lichtenstein's usual palette of red, yellow, blue, black, and white portrays a geometric face of predominantly sharp angles and bold lines. Lichtenstein's signature use of Benday dots gradually became less predominant and the thick contour lines, as well as striped diagonals and cartoonish wood grains, came to the fore as Lichtenstein's tool of choice in organizing space and form. As with Felixmüller and the other German Expressionists, Lichtenstein's composition presses forward to the twodimensional picture plane and any sense of depth is intuitive. In the case of Expressionist Head, the hands framing the face imply a three-dimensional posture, while the direction of the individual eyes hint at shifting perspectives for the head. As Edward Lucie-Smith writes, "Roy Lichtenstein was the master of the stereotype, and the most sophisticated of the major Pop artists in terms of his analysis of visual convention and his ironic exploitation of past styles" (E. Lucie-Smith Lives of the Great 20th-Century Artists, London, 1999). Multiple art historical tropes and knowing appropriations are synthesized in a single canvas, including the traditional genre of portraiture and self-portraiture. Female and male heads were Lichtenstein's favored motif in the German Expressionist series, signaling the key role this genre played throughout art history. Even Modernist artists such as Picasso dealt with the question of the self-image in art, and the influence of paintings such as Picasso's 1907 Self-Portrait, with its almond-shaped eyes and skewed planar face that fill the canvas would have filtered through movements such as German Expressionism and thus into Lichtenstein's oeuvre. Arguably, the inspiration Lichtenstein tapped from German Expressionism and Cubism was purely aesthetic. Lichtenstein was interested in the art itself and not what it revealed about the artistic or social tenor of its time. Absent from Expressionist Head is German Expressionism's "emotional intensity, psychological meaning, and commitment to political expression... As he did with Futurism and Surrealism, Lichtenstein was more interested in capturing the movement's fundamental pictorial aspects than in probing its underlying beliefs and ideologies". (Ibid., p. 253) Instead, with Lichtenstein's signature primary colors and meticulous technical skill, Expressionist Head exemplifies his ability to translate motifs of modern art into his own idiosyncratic vocabulary. He brings important artists, including himself, down from their fine art plinths and breathes new life into the commonly reproduced icons of the past, reanimating aesthetic clichés, and placing them lovingly back on rarefied museum walls. Agnes Martin, The Desert. Signed, titled and dated 1965 on the reverse. Acrylic and graphite on canvas, 72 x 72 in. 182.9 x 182.9 cm. Est. $3.5/5.5 million. Photo: Sotheby's. NOTE: Agnes Martin wanted her work to be about a transcendent experience. Her philosophy centered on her spiritual readings and thoughts, drawn from many sources including the Bible and the writings of Chinese sages. Yet her ideas are not to be confused with religion or confined to an ideology. Her art is simultaneously intuitive and intellectual. She was able to see perfection in life and believed that beauty expressed perfection; as she noted, "The miracle of existence, is that we are able to recognize perfection in beauty. Beauty is unattached; when a beautiful rose dies beauty does not die because it is not really in the rose. Beauty is an awareness in the mind." (Exh. Cat., New York, Whitney Museum of American Art (and traveling), Agnes Martin, 1992, pp. 93-94) The Desert, from 1965, is a masterpiece from Martin's first decade of classic painting which employed traditional geometric shapes of square and rectangle to obtain an impersonal detachment and create an intellectual artistic format. Like the sands in the desert landscape dissolving into a hazy horizon, the muted palette of the present work expands in front of the viewer. and the organic, despite being in an urban landscape. Along with other titles from this time, including Flower in the Wind, Leaves, Milk River and The Rose, The Desert is evocative of her abiding sensitivity to organic beauty and predictive of the artist's move west and what is to come in her painting career. Gentle and unassuming, the present square composition is constructed of rows of rectangles placed by Martin "a little bit off the square, making a sort of contradiction, a dissonance...When I cover the square surface with rectangles, it lightens the weight of the square, destroys its power." (Dieter Schwarz, ed., Agnes Martin: Writings, Ostfildern, 1992, p. 29) Martin's verticals and horizontals display a devotion to a Minimalist vocabulary of line and geometry, yet differ in that their faint and quivering nature, a sign of the human hand behind them, lacks the hard edged perfection and industrial character of the movement. Martin felt deeply that an artist should aspire to represent and reveal reality through their creations, not in a literal sense but in a deeper and more emotive, philosophical and profound manner. As she wrote, "We are in the midst of reality responding with joy. It is an absolutely satisfying experience but extremely elusive... Works of art have successfully represented our response to reality from the beginning. The artist tries to live in a way that will make greater awareness of the sublimity of reality possible. Reality, the truth about life and the mystery of beauty are all the same and they are the first concerns of everyone." (Dieter Schwarz, ed., Agnes Martin: Writings, Ostfildern 1992, p. 93) Martin's The Desert offers rewards to the viewer who is able to quiet their mind and eliminate distraction; it embodies emotion in an abstract, timeless and unchanging realm. 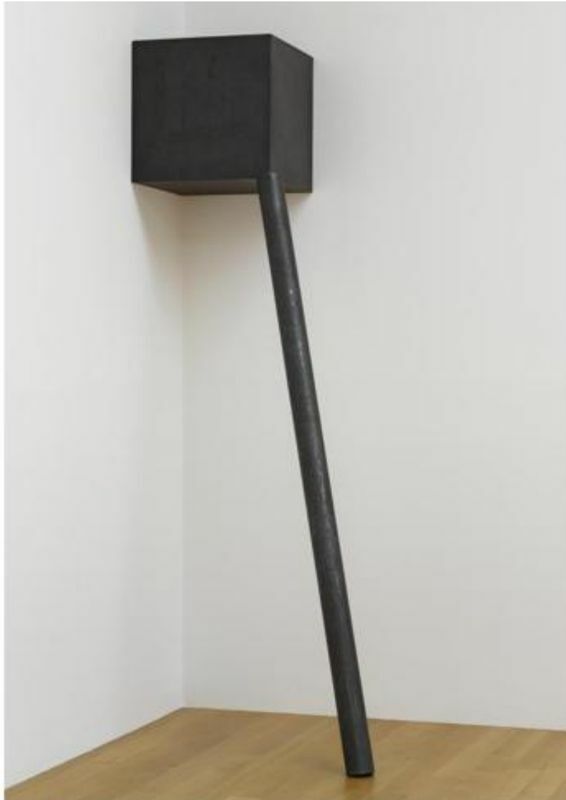 Richard Serra, Corner Prop. Steel in two parts. Height (Overall): 97 in. 246.4 cm. Cube: 20 x 20 x 20 in. 50.8 x 50.8 x 50.8 cm. Rod: 82 x 3 ¾ x 3 ¾ in. 208.3 x 9.5 x 9.5 cm. Executed in 1976, this work was remade with the artist's approval from the 1969 lead antimony original. Est. $2/3 million. Photo: Sotheby's. NOTE: In an interview with Kynaston McShine on the occasion of his 2007 retrospective at the Museum of Modern Art in New York, Richard Serra commented, "One of the first things I did when I started working in New York was to write down a list of verbs to splash, to tear, to roll, to cut and so on. I then enacted those verbs in the studio with rubber and lead in relation to time and place...The verb list allowed me to experiment without any preconceived idea about what I was going to make and not worry about the history of sculpture. I wasn't burdened by any prescripted definition of material, process or end product." (Exh. Cat., New York, The Museum of Modern Art, Richard Serra Sculptor: Forty Years, 2007, p. 27) For all its extreme materiality, Serra's oeuvre contains a conceptual core of premises that the artist has explored with ever increasing rigor. Corner Prop, from 1969/1976, embodies a combination of the artist's oft-quoted verb list, and is a classic example of the Prop series, the ultimate distillation of his aesthetic pursuits at the beginning of his long career of sculptural innovation. The vertical rod recalls "to roll'', which is the first verb in the list, and it enacts several of the transitive properties on the list, "to support'', "of tension'' and "of equilibrium'', creating an organic whole. The cube and rod are "propped", supported by a symbiotic state of balance and counter balance, weight and counter weight that comes into play at each point of contact between the steel elements, the floor and the walls. 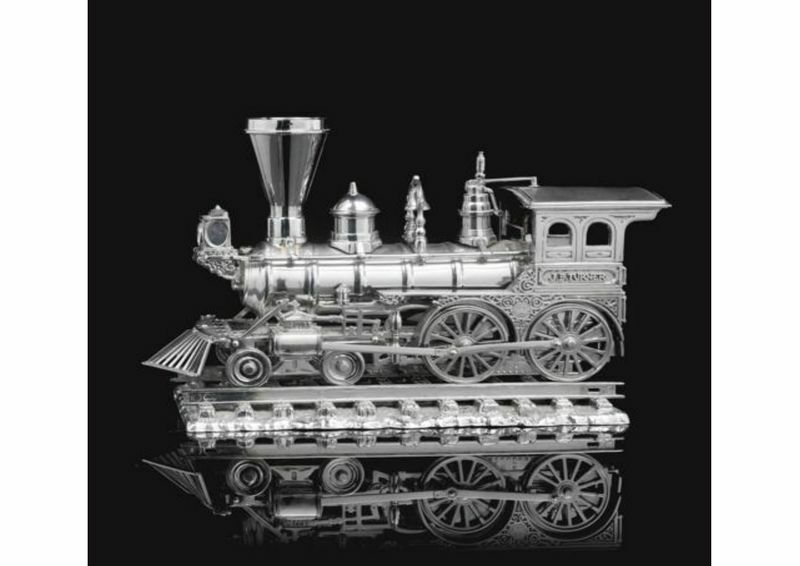 Originally made of lead antimony in 1969. Corner Prop was subsequently remade in steel in 1976 when lead proved too malleable a medium for Serra's increasingly ambitious sculptural designs. Another lead antimony Corner Prop was also made in 1969 and is currently in the Friedrich Christian Flick Collection. The present work was a milestone with far-reaching implications for contemporary sculpture. Contemporary artists, following the lead of Constantin Brancusi, had simplified form into basic shapes and many of the Minimalists had long adopted the use of industrial materials to fabricate works that did not exhibit any trace of the artist's hand. Serra's Props pushed this modernist approach to sculpture to its most extreme conceptual basis. Elegantly simple in its premise, Corner Prop is among the artist's first explorations into a subject that continues to inform his career. In the 1960s Props, Serra liberated his sculpture from the traditional relationship of object and base, as well as from the historical methods of carving and casting. Many of the earliest works from the series that primarily used rolled lead rods and square plates were shown in a 1969 exhibition at the Solomon R. Guggenheim Museum in New York which also purchased Right Angle Prop for the permanent collection. The sculptural elements in the Props achieve stability from the exertion and tension of the weight of each toward the other and toward the wall and floor in a constant labor of elevation that engages and defines the space around the work and the viewer. The strong vertical element in Corner Prop can be compared to Barnett Newman's articulation of his signature painterly "zip" in the three-dimensional realm of sculpture. Executed just a few years earlier, Newman's 1962 sculpture Here I is the ultimate expression of the artist's tendency to a more Minimalist style than his Abstract Expressionist contemporaries and a precursor to the hard-edged post-painterly abstraction to which Richard Serra would relate. Maurizio Cattelan, Untitled. Painted wax, hair and fabric. Figure: height: 59 in. 150 cm. Hole: 23 5/8 x 15 3/4 in. 60 x 40 cm. Executed in 2001, this work is number three from an edition of three plus one artist's proof. Est. $3/4 million. Photo: Sotheby's. NOTE: Maurizio Cattelan has a deep understanding and highly intellectual approach to art history that is primarily characterized by a distaste for and distrust of the institutionalization of art. Through a long career of art-world subversion, he wants to free us to engage directly with art and come to our own terms with the images presented to us, rather than rely on preconceived notions imposed by art critics, curators, collectors, writers and even in some cases, by artists who aggrandize the myth of art creation rather than the art object. Untitled (2001) is one of the penultimate statements of Cattelan's role as the outlaw or outsider who fights against the comfortable suspension of judgment inherent in imposed knowledge. He seeks to liberate art from the realm of the sacred and return it back to the realm of the secular world, demystifying it and forcing us to once again freely question and analyze our own perceptions and ideas of art. Just as a meteor strikes the Pope in Cattelan's great La Nona Ora (The Ninth Hour) of 1999, rendering him no longer untouchable, the present work perfectly summarizes Cattelan's intention for art to be purloined out of the static realm of the museum and back into the world. Cattelan's 1996 paintings of slashed 'Z's announced his self-appointed mission as the outlaw who would challenge and disrupt the authority of the hierarchical system of the art world, just as the fictional Zorro was the sworn enemy of the Spanish rulers in the Mexican province of California. Cattelan is the ultimate outsider a self-taught artist of humble background who courts controversy and operates outside the rules of the system. In order to successfully challenge the institutionalization of art and the power of its control, Cattelan is obliged to camouflage himself as a buffoon in order to criticize and subvert the institutional system, which, like all systems of power and order, can be intolerant of challenge or assault. Through his wit, his humor and his presence as selfportrait in works such as Mini-Me (1999), Cattelan forces us to realize that we too easily accept the 'canonization' of art presented to us in the pristine, white-walled expanses of museums and galleries. Even when our initial instinct is to question the quality or nature of the art we see, we are bedazzled by the sanctity and aura of a museum's authority and rely instead on the hidden power of institutional acceptance. Cattelan disdains this hermetic and mundane approach in a famous quote from 1999, "Art is what's left between a fax to a gallery, a phone call to a collector and a reservation at some hip restaurant in Tribeca" (interview with Barbara Casavecchia, "I want to Be Famous Strategies for a Successful Living", FlashArt, no.215, Milan, April-May, 1999, p. 82) Cattelan instead prefers that we express or confront our own inner doubts and insecurities to engage with the art more directly and honestly. Taking on the role of jester, Cattelan seeks to expose the machinery behind the curtain behind the orthodoxies - much in the same way as Dorothy does in The Wizard of Oz. From this point onward, the schism created by ideological art was further enhanced by the aura of the artist as myth or as biography, perfectly represented by Joseph Beuys who is almost the nemesis of Cattelan's pursuit. Beuys' oeuvre is informed by and defined to a large extent by the objects and materials that serve as metaphors of his legend. In La Rivoluzione Siamo Noi from 2000, a miniature effigy of Cattelan, clothed in Beuys' famous felt suit, hangs dejectedly from a clothing rack, imprisoned by the shamanistic persona promoted by Beuys. The work bears the same title as a 1972 work by Beuys where the artist is striding toward the viewer and his felt suit was a sign or metaphor of regeneration. In his work, Cattelan slyly subverts the premise of "we are the revolution" of the title, since his figure is suspended above the ground and trapped into inaction. Cattelan again proclaims his wish to demystify art and to return it from the realm of cognition or conceptual metaphor back into the realm of immediate sensory perception. In Untitled (2001), Cattelan has committed the ultimate act of purloining or returning art from its pedestal. As an outsider, even an outlaw, many of Cattelan's works dealt with police authority, not just aesthetic authorities. The broken safes of -157.000.000 (1992) actually picked open by thieves celebrate the criminal act of confiscation of guarded treasures or values. Super noi (Super Us) from the same year is constructed from composite portraits of Cattelan based on descriptions given to police sketch artists by various friends and relatives. Cattelan has alluded to a criminal's escape with the knotted sheets dangling from the window as if the remains of an action in Una Domenica a Rivara (A Sunday in Rivara) from 1996 installed at Castello di Rivara in Turin. In this work, "Cattelan radically abandons the space of seriousness and respect for traditions symbolically embodied in the architecture of the castle and in the machinery of the art world and engages in a rebellion devoid of any political program" (Francesco Manacorda, Supercontemporanea: Maurizio Cattelan, Milan, 2006, p. 47). By 2001, this cultivated persona of the burglar is ready to tunnel into the inner sanctum of the museum in the present work, entering the art institution to disrupt it and taking us with him. In the present work, one of Cattelan's self-images emerges from the floor into a gallery of enshrined art history, parodying the veneration of art. Cattelan's oeuvre of the 1990s had included many instances of interventional practice, often in an institutional setting or public setting. In 1997 at Le Consortium in Dijon, Cattelan "dug a coffin-shaped hole in the museum floor and also blocked the entrance to the gallery offices with the front of a wardrobe, which the employees were obliged to pass through to reach their working areas. 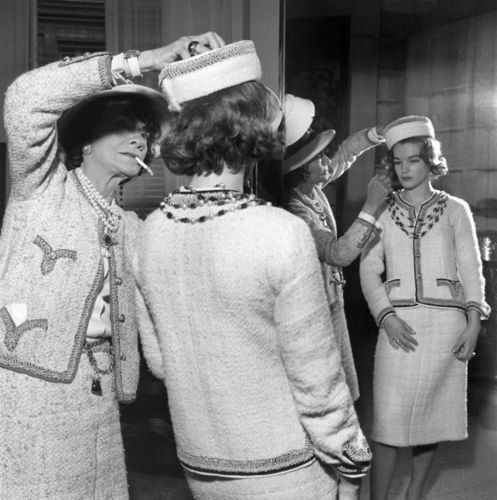 ..The wardrobe in Dijon was an attempt to define the screen that divides the public from the private.'' (Bonami, et. 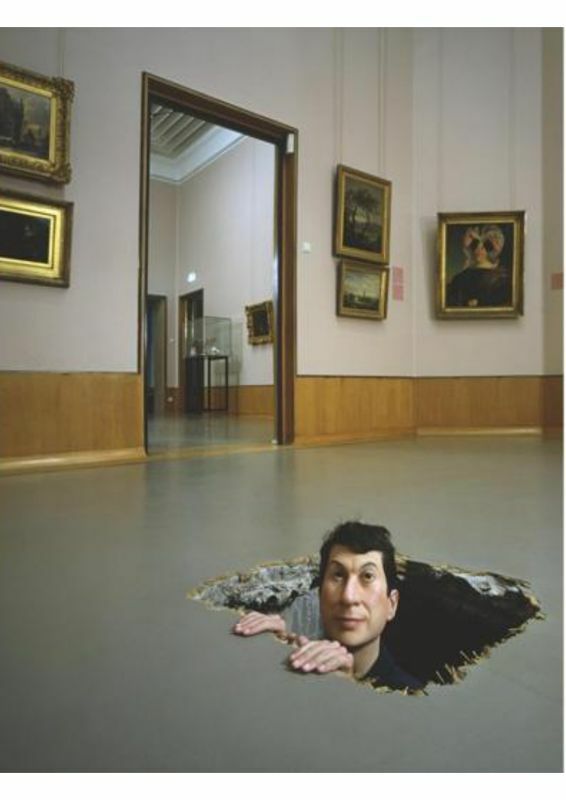 al, p. 85-87) In the memorable 2001 installation of Untitled at the Museum Boijmans Van Beuningen in Holland, the artist's visage emerged up through the floor into a gallery of 18th and 19th Century Dutch paintings. His surrogate self can now be provocatively installed in subsequent museum exhibitions or the home of a collector, but in all cases Cattelan breaches the confines of a temple of art. The interloper has arrived, quizzically gazing around him. "The figure's furtive and cautious gaze makes the scene a metaphor for Cattelan's own position in the history of contemporary art. The artist chooses to depict himself in an illicit position, entering the treasure-house of art history as an interloper. In this way his artistic practice in general is revealed as a form of aggravated burglary of the established and canonical system." (Ibid., p. 81). In this work, the renegade of art has subverted the act of appropriation begun by Marcel Duchamp. Whereas Duchamp initially smuggled ordinary, prosaic objects into the sacred realm of art, Cattelan now steals art from the sacred back to the world we inhabit, all the while highlighting the absurdity of the process. 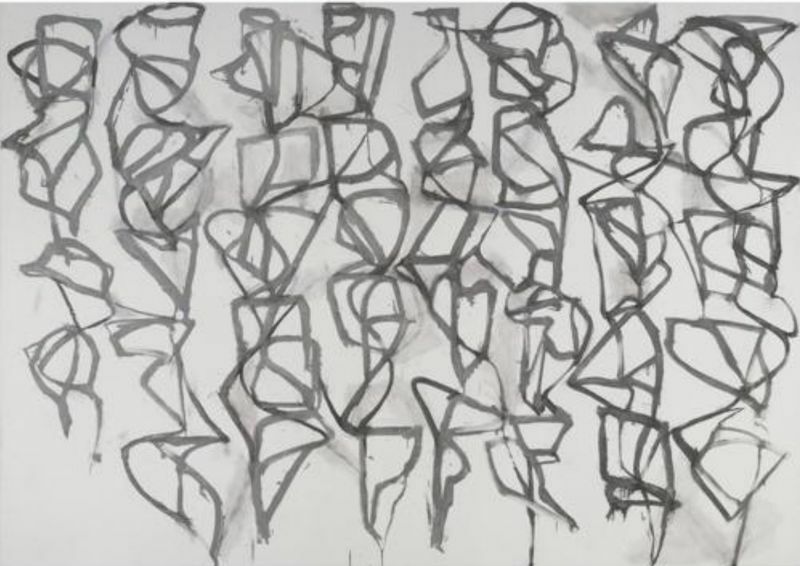 Brice Marden, Cold Mountain I (Path). Oil on canvas, 108 x 144 in. 274.3 x 365.8 cm. Painted in 1988-1989. Est. $10/15 million. Photo: Sotheby's. NOTE: Brice Marden's trajectory as an artist encompasses a dramatic shift in his painterly vocabulary and defies critical concepts about the boundaries between seemingly contradictory schools of painterly expression. Striving toward a reinvention of style and a departure from critically acclaimed work can be a risk but it is a vital one for artists to retain a sense of vitality and discovery in their work. Few contemporary artists have navigated this journey with as much success as Marden. Cold Mountain I (Path) is the culmination of Marden's journey toward this new style of painting and a testament to his exploratory spirit. Titled for Han Shan, known as Cold Mountain, a legendary 8th or 9th century Chinese poet, the Cold Mountain series of six monumental canvases manifest the many threads of innovation leading away from Marden's monochromatic, beeswax paintings of the 1960s and 1970s. The gestural tracery vertically arrayed across Cold Mountain I (Path) is a finely balanced composition with lattice-like organization that hints at the influence of nature and the human figure throughout Marden's artistic enterprise. Yet it stands as a work that also announces the primacy of drawing and the impact of calligraphy, Asian art and poetry in Marden's new paintings that followed. or a Bodhisattva (an enlightened being in Buddhism). Both Tao (literally translated as `The Way' or `The Path') and Zen Buddhism encompassed Han Shan's poetic vision of returning to the solitude of nature as a metaphor for a human's inner quest, as expressed in Gary Snyder's translation of Han Shan's poetry. Han Shan mentions writing his poems on the rock walls of his mountain home and Asian calligraphy and art had a concrete influence on the Cold Mountain compositions. In 1984 Marden attended the Masters of Japanese Calligraphy, 8th 19th Century exhibition at the Asia Society in New York. Based originally on objects in nature and life, calligraphy, over the centuries, "went on to gather sophisticated aesthetic and pictographic complexity and refinement, [while] it retained the mesh of the traces of the kinesthetic movements of the hand with the patterns of the forces of nature." (Klaus Kertess, Brice Marden: Paintings and Drawings, New York, 1992, p. 41) Marden immersed himself in the study of calligraphy which he admired both as a graphic art and for the content it expressed. He was inspired by the way the poetry was aligned on a page, in rectilinear columns that echoed the vertiginous depictions of mountains and waterfalls in Chinese landscape paintings as well. The couplets of the Chinese poetry scrolls mirrored the compositions of Marden's multi-panel paintings of deeply saturated color such as Conturbatio (1978). This evolved into Marden's more architectonic paintings of the early 1980s known as the "post and lintel'' paintings, such as the 8 x 15 foot Thira (1979-80, Collection of the Musée National d'Art Moderne, Centre Georges Pompidou, Paris). In the single panel masterpieces to come, the structure of these multi-panels would be internalized and become the organizing armature for the linear forms of Cold Mountain 1 (Path). In November 1989, more than six months after completing the present work and about the time Marden began the remaining five paintings, he gave an informal talk on Jackson Pollock at the Museum of Modern Art, New York. Marden could well have been characterizing his own journey in the creation of the penultimate Cold Mountain 1 (Path) when he commented "To maintain any kind of life as an artist is to make change. Yet for most observers change in an artist's work is the most difficult thing to accept." (Ibid., p. 40) Marden's ability to master both the opaque and the transparent, the monochromatic and the multi-hued, the non-gestural and the gestural attest to his desire for evolution and progression that mark him as an artist of true talent. The recluse Han Shan composed his poems in the high regions of Cold Mountain and wrote "Accepting my fate I fled to the woods, to dwell and gaze in freedom" and "for the key to immortality, within ourselves is the chief of spirits''. Marden's assured linear touch, floating amid a misty ground, perfectly evokes his original inspiration in Cold Mountain 1 (Path). Jeff Koons, Jim Bean – JB Turner Engine. Stainless steel and bourbon, 11 x 17 x 6 1/2 in. 27.9 x 43.2 x 1,5 cm. Executed in 1986, this work is number three from an edition of three plus one artist's proof and accompanied by a certificate signed by the artist. Est. $2/3 million. Photo: Sotheby's. Andy Warhol and Jean-Michel Basquiat, Untitled. Acrylic, silkscreen and oil paintstick on canvas, 116 x 165 1/4 in. 294.6 x 419.7 cm. Executed in 1984. Est. $2/3 million. Photo: Sotheby's. The combination of Warhol's mechanically reproducible, flat images obviously appropriated from mass media and Basquiat's hand-painted physicality and purposeful primitivism served both artists well, warming and cooling, respectively. As Trevor Fairbrother wrote in 1996, "Warhol's most recognizable contributions to the collaborations are flat graphic motifs from advertisements and newspaper headlines. He often painted them big enough to be oppressive, but his loose, consciously imperfect technique gave them a worn-out, almost bogus aura... In contrast, Basquiat's contributions are frenetic and forceful; often they seem to glower at the viewer. While he mimicked the rawness of pictures by children and naives, Basquiat made his marks with eloquence and assurance, and endowed them with a fierce presence." (Trevor Fairbrother, "Double Feature,"Art in America, September 1996, p. 81). The large dimensions of Untitled 116 x 165 ¼ inches not only provided the ample canvas space necessary for both artists to work, but the great size exemplifies their larger-than-life personas. As was typical in the Collaborations, Warhol was the first to lay down his images here, baseball mitts, tennis rackets, sneakers, numbers, and the Zenith electronics logo. Then, once the graphics were blocked, Basquiat filled in other parts of the canvas with his signature swathes of color, childlike scrawl, and totemic heads bearing toothsome grins and spiky hair. The power of Untitled is derived from a synthesis so complete that the result almost appears to be painted by a third party. The chaos of the composition expresses both the manic excitement of youth and the cumulative experience of age. "½" looms large on the canvas, iterated three times in different sizes. Reading the fraction as merely a literal expression of the Warhol/Basquiat splitting of the canvas would be incorrect though, for the painting is nothing if not shared, nothing if not one. A rare union of artists from different generations, Untitled evinces a creative tension in the best sense, a fully activated composition that is close in kinship with Basquiat's desire for the viewer to delve through layers of symbolism and meaning.